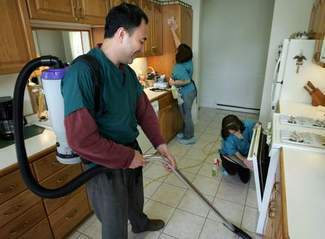 Wells Ye needed guidance in fulfilling his ambition to start a business providing true non-toxic green House Cleaning services in the northwest suburbs of Chicago. He sought the advice of SCORE counselor Earl Schraiberg. 1. Safe and True Non-toxic Green House Cleaning: protect your family and pets for a healthier home environment. 2. Trustworthy and Well Trained Employees who understand customer service and know how to use non-toxic green cleaners. 3. Advanced Allergy Relieving Equipment that captures 99.97% air borne contaminants and allergens. 4. Revolutionary cross-contamination control to reduce the spread of germs and virus that cause seasonal illness. STAR House Cleaning System TM is the corner stone of Wells’ business model. It ensures the highest quality of service in the house cleaning industry. During this process, he continued to consult with Earl and receive his suggestions and advice.